We recently had the opportunity to spend a fun and sun filled weekend in one of our favourite provinces, Prince Edward Island, thanks to Tourism PEI, Northumberland Ferries and the Cavendish Beach Music Festival. There really is no place like PEI in the summertime, it’s all about long, sunny days, endless blue skies, frollicking in the warm waves of the Northumberland Strait, and fish, fresh off a fishing boat. We make it a mission to get there every summer, and each time we make new discoveries- restaurants, beaches, and long winding roads we’d never been down. Although it’s a relatively small island (and Canada’s smallest province), there are always loads of festivals, events, and activities to keep you busy all summer long! Below we’ve made a list of some of our favourite discoveries from this summer and many summers past! Gahan House, Charlottetown: A vast menu with something for everyone, and the food happens to be delicious. However, our favourite thing here is their own craft beer. My go-to is their Blueberry Ale and Trevor’s is the Beach Chair Lager. Blue Mussel Cafe, North Rustico: We’re already trying to figure out when we can get back to this place. Mainly outdoors but covered, this is a great spot by the water. Fish and seafood is extremely fresh- everything we tried here was delicious! Sugar Skull Cantina, Charlottetown: This place has a great outdoor space, a large array of margaritas, and plenty of Mexican beers as well! Their menu is relatively small, featuring a few starters including pico de gallo and guacamole, and a whole bunch of different tacos. We’ve spent a fair amount of time in Mexico so our taco standards are extremely high. I would say these ones are good but not exceptional, however, given they are likely the only place for Mexican on the island it’s definitely worth a visit. The Dunes, Brackley Beach: This place is always busy so expect to wait! However, while you wait you get to browse their beautiful gallery full of local Island art. And trust me, the food is worth waiting for! Terre Rouge, Charlottetown: A bit of a splurge but well worth it! This place has some of the best food in Charlottetown, it also has a cool vibe and great service. The Charlottetown Beer Garden, Charlottetown: A great patio with loads of outdoor seating. We haven’t tried the food here but they have a great tap list full of local favourites. Cows Ice cream: Don’t forget to finish your evening off with a delicious treat at Cows Ice Cream. They have what is likely the best ice cream (with the best names ever!) and waffle cones on the Island. PEI has some of the absolute best beaches in Canada, and also the warmest waters north of Virginia, so what’s not to love? Because PEI is an island (shocking, I know), it means there is a huge abundance of amazing beaches in every direction. Along the Green Gables Shore are some of the nicest and busiest beaches. Make your way into Prince Edward Island National Park (all of Canada’s National Parks are free in 2017) and drive until you find one you like. You’ll find fully serviced beaches such as Brackley, Cavendish and Stanhope or smaller and quieter beaches with hardly another soul on them. If you enjoy biking, the National Park also has a fabulous bike lane that is separated from the road, making it a perfect spot to go beach hunting. This year we made the awesome discovery of Thunder Cove Beach. Going forward it will likely be our go to beach! Somewhat of a hidden gem, this is not a serviced beach, so come prepared. The beach is long and perfect for walks, and is surrounded by PEI’s famous red cliffs, if you keep walking you’ll eventually come across some amazing rock formations, one that is aptly named “teacup rock”. This place is absolutely not to be missed if you’re on the island! Take the Ferry: Okay, so maybe this is a mode of transportation but it can also be a fun activity! If you’re either arriving from Nova Scotia or heading there after PEI, definitely consider Northumberland Ferries. Before/after a long drive it’s the perfect break where you can eat, enjoy some entertainment and take in the incredible views before getting back in your car. Cavendish Beach Music Festival: This country music festival happens just once a year! Attracting some of the biggest artists on the charts, if you’re a country music fan, you can’t miss out. We had the opportunity to spend one evening there during the most recent festival and we can attest that it was perfectly organized, we hardly waited in line, and the shuttle to/from Charlottetown was seamless! 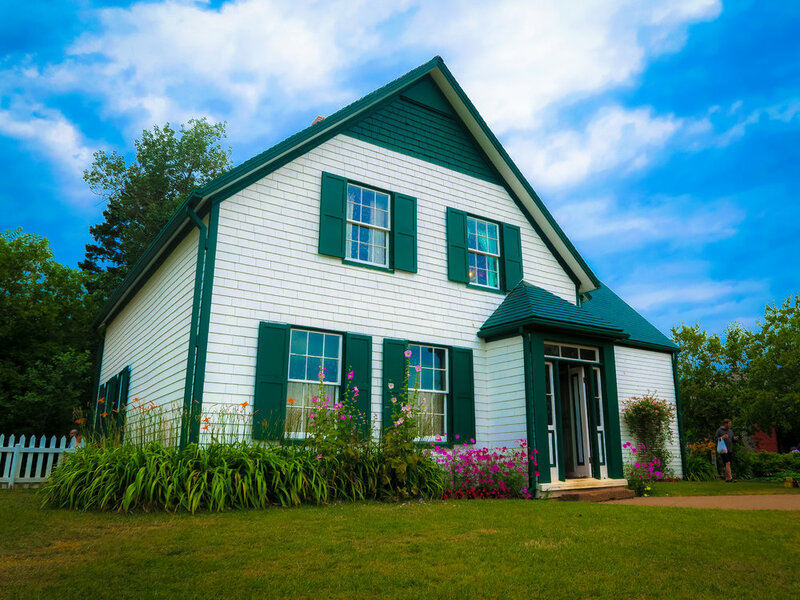 Visit Green Gables: Just steps away from the music festival is the home that inspired Lucy Maud Montgomery’s Anne of Green Gables classic book series. I grew up on the books and the movies so I find this place especially interesting. However, even if you are unfamiliar with the famous red haired heroine, you can still enjoy the grounds and history. Just drive: We’d both highly suggest just getting in your car and driving. The Island has so many tiny hidden gems, beautiful windy roads, and small towns, you’ll never know what you’ll find! It’s fun to just get in the car and explore! Whether you’re just hearing about the island for the first time, or you’ve visited in the past, we’d highly recommend planning a summertime vacation to this beautiful province! It’s a place that has something to offer for everyone. If you’re looking for a fun family vacation, a couples getaway, or a weekend with friends, there are options for every type of traveller. If you crave adventure, spend the day ocean kayaking, or if you’re in need of downtime, take a blanket and a picnic to the beach- you can’t go wrong! However, the summer season is really busy and books up quickly so don’t wait too long to start planning! Given that we try to make it at least once a year, hopefully we’ll see you there!! *Our recent trip to Prince Edward Island was done in partnership with Northumberland Ferries, Tourism PEI, and the Cavendish Beach Music Festival, however, all opinions are our own.